Between Brighton Station and North Street is a network of interconnecting streets that even most locals struggle to correctly name. Is it the North Lanes, or North Laine? North Laines or the North Lane? Whatever you call it, the area is home to dozens of cafes, bars, pubs and restaurants, serving everything from instagram-friendly flat whites to Nepalese beef stews. 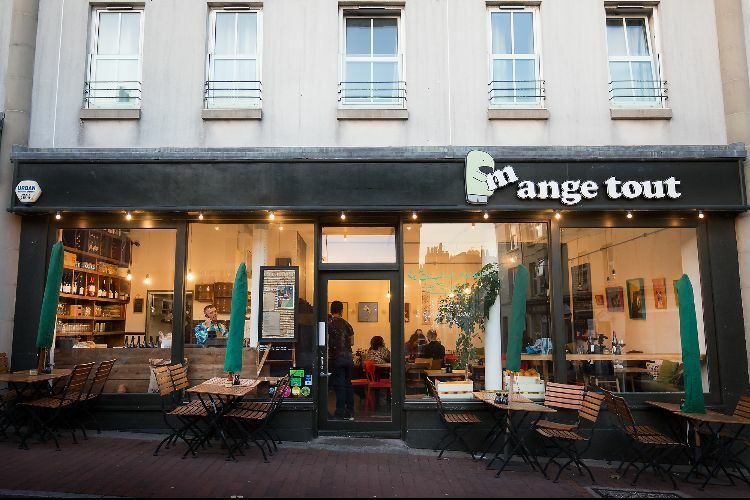 But among the many hip and varied venues – several of which are excellent choices themselves – Mange Tout Brighton stands out as an authentic and assured choice that has long been a firm favourite among those who live and work in the North Laine area (following extensive research I can confirm this is the correct name and spelling). Open 9am to 5pm Sunday to Wednesday, and 9am to 9.30pm Thursday to Saturday, Mange Tout serves French bistro style breakfast, brunch and lunch every day. 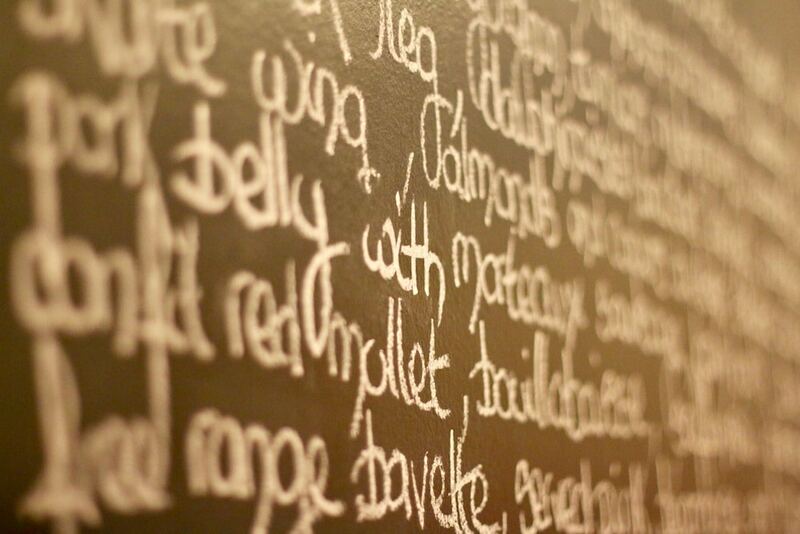 But if you want to try the dinner menu as we did, you’ll have to visit on a Thursday, Friday or Saturday night. 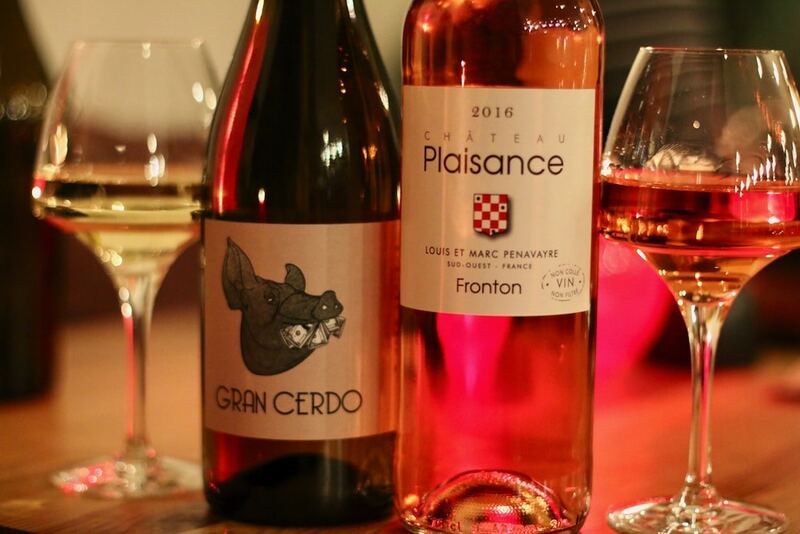 Just like its sister restaurant, Plateau, Mange Tout has a healthy obsession with biodynamic and natural wines. The knowledgeable waiters will be able to give you a much better idea of exactly what that means, but essentially, it’s organic – and some. In other words, if you don’t like the idea of chemicals going anywhere near your tipple, biodynamic is your thing. Personally, I’m much more interested in the taste than the method of farming or fermentation. And on that count, Mange Tout seem to have it nailed. All the wines recommended by our waiter were delicious, but the first was something I’ve never even heard of before – an orange wine (that’s the colour orange, not the fruit), that sits somewhere between a rosé and a red. It was slightly cloudy in appearance, but had an incredible balance of hearty spice and pithy fruit. If you’ve not tried an orange wine before, I’d highly recommend giving this one – the Baglio Bianco Catarrato – a go. We were lucky enough to sample three different starters, all with their own merits. 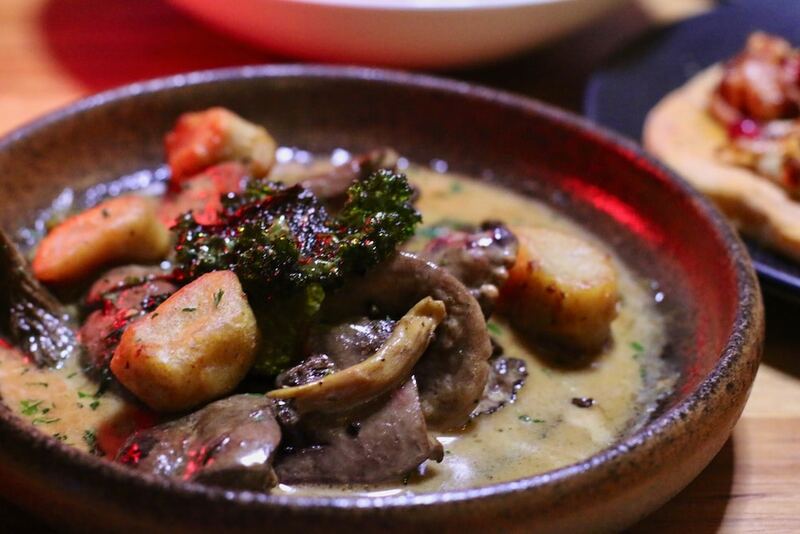 The duck livers with tarragon were perfectly cooked and beautifully rich, nestled between some lovely gnocchi and crisp kale, in a creamy wild mushroom sauce. 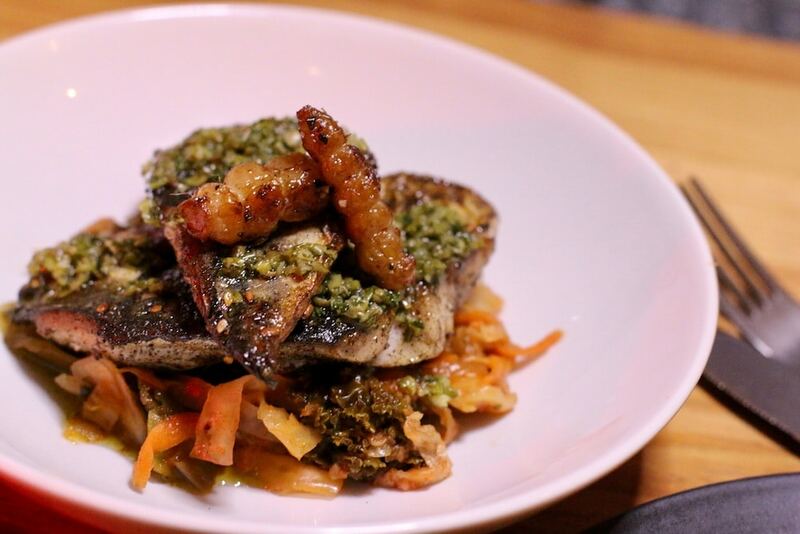 Also delicious, albeit at the other end of the flavour spectrum, was the mackerel fillet with kimchi and salsa verde. Fresh and spicy with a delicious acid bite that cut through the fish, it couldn’t be further from the aforementioned liver dish, but was just as memorable. 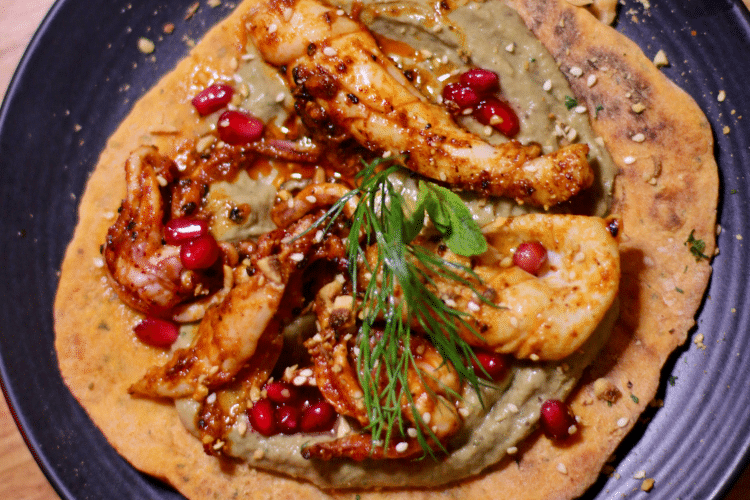 For me though, the undeniable star of the starters was the harissa squid with babaganoush and dukkah on a flat bread. Full disclosure: I absolutely love squid in any form. Even a rubbery frozen calamari makes me happy, but this dish is something really special. The squid itself was beautifully tender and delicately spiced; the babaganoush was creamy and smoky; the dukkah spices were perfectly balanced. Finished with a scattering of pomegranate seeds, this was genuinely as good a dish as I’ve had in Brighton. As always, we found it tricky to decide on the mains and, on finally making a decision, immediately felt anxious it was the wrong one. We needn’t have worried. 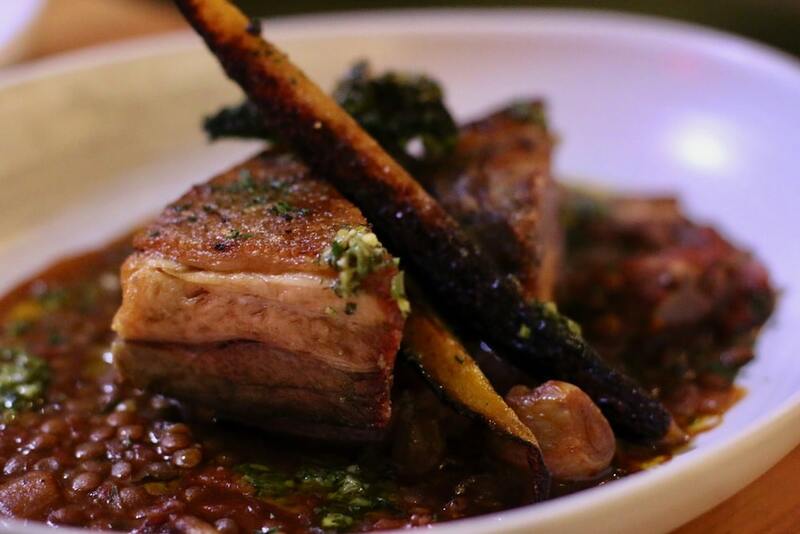 The pork belly with morteau sausage, ham hock and braised lentils was a rich and indulgent affair, which I decided would be better named Pork³. Yes, the gravy was rich and smoky and yes, the lentils added an earthy bite, but this really was all about the pig. Each element amplified the next, creating a delicious trio of meat flavours and textures that would satisfy any hardened carnivore (though I’d not recommend it for someone with a preference for lighter dishes). 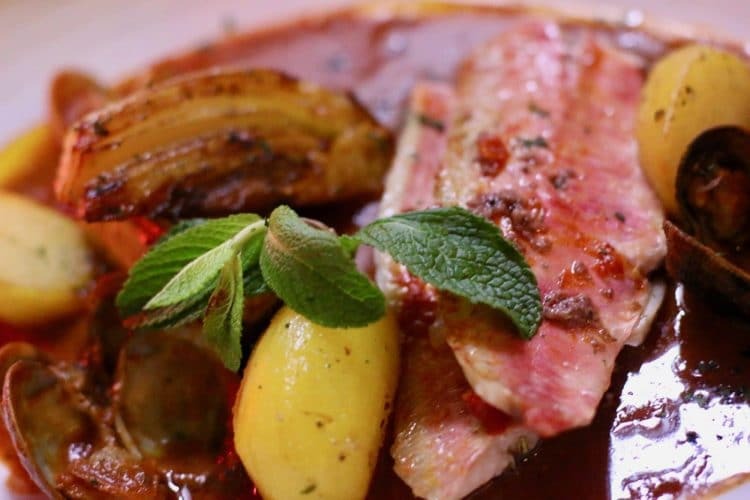 We also tried the confit red mullet with bouillabaisse and saffron new potatoes. Again loads of rich smoky flavours, but with a lighter touch than the pork and some sweet and juicy clams on the side. All in all, a fantastic fish course. 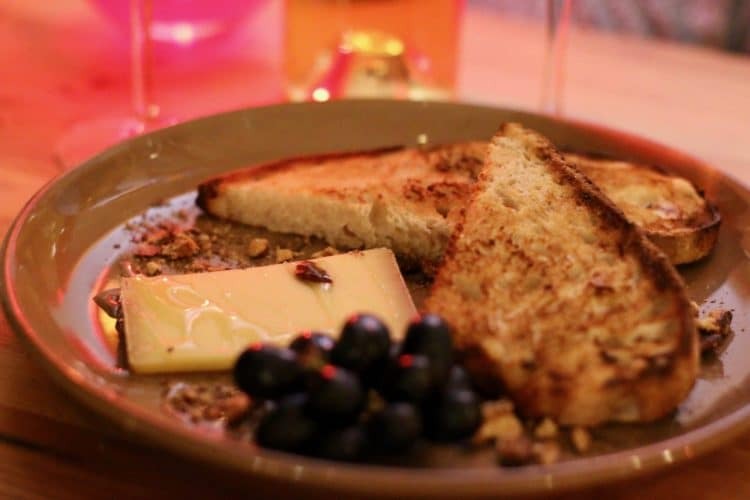 With little room left after pigging out on starters and mains, we bravely soldiered on, ordering a comté from the cheese menu, which came delightfully drizzled with honey, and served with sourdough, truffle shavings and a nut crumb. We also couldn’t resist the blood orange bakewell, which had a lovely bitterness to the filling, a crumbly pastry casing and was served with a sweet honeycomb ice cream. An aptly indulgent end to the meal, washed down with a Jurancon dessert wine. Big, bold flavours, generous portion sizes, an eclectic menu and friendly staff. 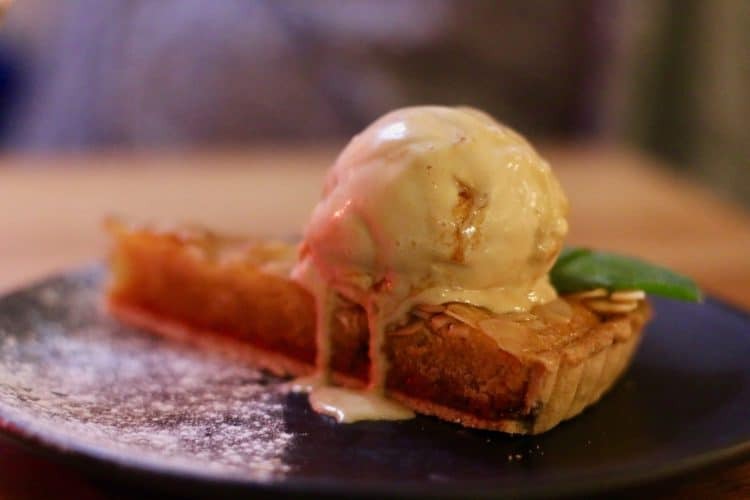 Mange Tout Brighton’s dinner menu may not be for the faint hearted, but you’ll be hard pressed to find anywhere else in the area that has this much character and authenticity. And if you do have a preference for lighter dishes, their breakfast and lunch menu is a great option too. Highly recommended.